Brother Jesse Blog: Book Review: " Gabby: A Story of Courage and Hope"
Book Review: " Gabby: A Story of Courage and Hope"
In a world where the media is constantly displaying gloom and doom images of people who have just given up on life and caved in on the circumstances surrounding them, there is one particular glimpse of light that shines boldly through unapologetically. 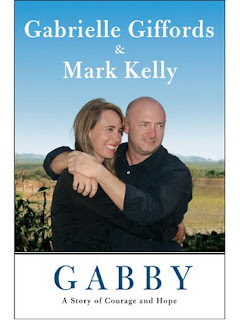 Gabrielle Giffords and Mark Kelly's book, Gabby: A Story of Courage and Hope, is one story of inspiration that all should take the time to read and see how a woman with an extremely optimistic view on life is steadily overcoming one of the most traumatic recovery experiences in human life. On January 8, 2011 (a little over a year ago) former Congresswoman Gabrielle Giffords was shot in the head at point blank with the bullet passing through the left side of her brain, leaving her for dead. Despite this horrific injury, she has survived and not only that, is on her way to a 100% recovery. Many have wondered how could this be possible? When you read the book you will see the action of faith demonstrated that has been a guide for her recovery and at the same time feel the inspiration of how overcoming any obstacle in one's personal life is indeed possible. The transitions between her life prior to the shooting, during the shooting and in rehabilitation makes for an outstanding made for TV movie on Lifetime! One learns of her family upbringing and sacrifice to rescue the family business after graduating from school and how these events led to her desire to want to serve in Congress. It also gives the reader another view of politics that we don't normally see when we watch mainstream media. Talk about getting an inside track! You go behind the scenes and see what really happened on that fateful day of January 8th, unadulterated, and how news media pronounced her death prematurely and tried to clean it up their error. Politics aside, the love and support from Gabby's most avid supporter does not go remissed. Mark Kelly gives such a wonderful account of how the family was constantly in her corner every second during her recovery and shared some of his personal stories as well about his upbringing and life as a NASA Astronaut. For those interested in learning more about the historical mission of The Endeavor, Mark Kelly's account of it as the chief pilot definitely gives you the inside look of what it takes to prepare and go on such a mission out into space. Beyond that, you learn the absolute truth of why he didn't step down from that mission, despite the tragedy that had just taken place in his life. This is a book for all denominations because the key connecting theme that everyone should walk away with at the end of it all is ,"In order to overcome life's challenges, faith will get you through." If this book had to be given a rating on a four star scale, I would give it five!